Monday, Oct. 29, 2018, 3:30 – 5 p.m. Professor Naomi Sokoloff will discuss her new book “What We Talk About When We Talk About Hebrew (and What It Means to Americans),” co-edited with Professor Nancy Berg of Washington University, St. Louis. 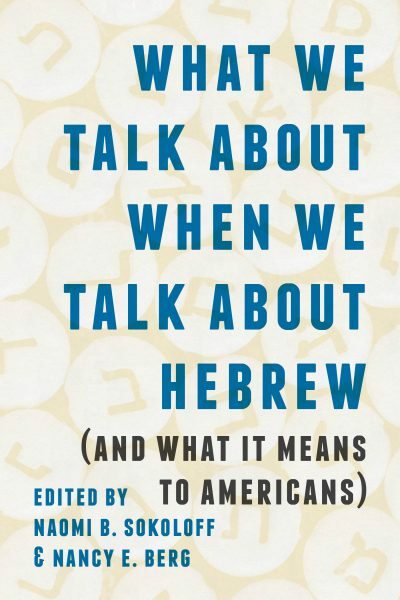 “What We Talk About When We Talk About Hebrew (and What It Means to Americans)” is available from the University of Washington Press. Read a review from Moment Magazine and a writeup by the Katz Center for Advanced Judaic Studies at the University of Pennsylvania. A catered vegetarian reception will follow the talk.